Of all the famous and important classic races around the world, there is only one named after a horse. The Preakness Stakes is the second jewel of the American Triple Crown and has been run every year at Pimlico Racetrack since 1873. The race was named after the first horse to win a stakes race at the old track. Owned by keen horseman Milton Sanford, the horse Preakness won the inaugural Dinner Party Stakes on October 25, 1870. This race was instituted by Maryland governor Odgen Bowie, a keen turf enthusiast, and is now known as the Dixie Stakes. Sanford named the horse after the area he kept his racing stable in, known as Lower Preakness. His Sanford Place farm, which cornered at one end of intersection at Preakness Avenue and Valley Road, would be later renamed Preakness Farms. Sanford also became one of the founders of the Jockey Club in America. 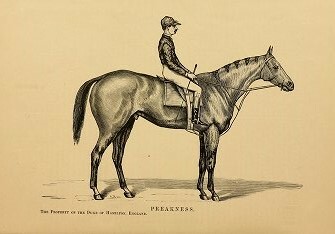 Preakness was bred in 1867 by A.J. Alexander in Kentucky. His sire was the immortal Lexington, sixteen times leading sire in America. The dam of well made colt was Bay Leaf, a daughter of Yorkshire. Looking at the pedigree of Preakness we see his second dam Maria Black was inbred 3×3 to the great British sire Sir Peter Teazle, while his grandsire Boston was likewise inbred 3×3 to American foundation sire Diomed. Sanford paid $4,000, a hefty sum back in the day, to acquire him from Alexander. The colt was a spirited soul and won the first race he entered, the Dinner Party Stakes, when he was a three year old. Back in the nineteenth century, horses did not run much as two year olds nor as three year olds. Once they hit the age of four, the racing frequency was increased and many legends were established. Preakness certainly comes under this category. In 1871, the now four year old Preakness captured the Westchester Handicap and the Maturity Stakes. His five year old season did not reap a stakes victory, but he did finish second in the Grand National Handicap to Tubman, and the Long Branch Stakes to Midday. 1873 however would see the son of Lexington establish himself one of the country’s great horses. Preakness won four stakes races during his six year old season. In the two miles two furlongs Grand National Handicap he defeated the great Harry Bassett, a champion of his division for three consecutive years, who had set numerous track records during his distinguished career. Preakness also won the Manhattan Handicap, Long Branch Stakes, avenging his other defeat from the previous year, and the Jockey Club Handicap. In the JC Handicap, he set a Jerome Park track record for the ten furlong distance. The following year Preakness won his second consecutive Jockey Club Handicap defeating Springbok. However he would finish second by a nose to Springbok in the Saratoga Cup. This race carried more prestige back then and Springbok would go on to become the Champion Handicap Horse in the nation. Springbok set two track records during the season, while Preakness set a fourteen furlong track record at Pimlico during the same season. The next year, Preakness and Springbok hooked up again in the Saratoga Cup and the race became one of the fabled races in turf history. The 1875 race attracted every top handicap horse in training. Seven contenders for the Handicap Championship contested the race. Preakness and Springbok dashed off from the start in tandem, running away from the stellar field. The race became essentially a match race between the two. Think Affirmed and Alydar in the 1978 Belmont for a modern equivalent. Preakness and Springbok ran side by side for the entire eighteen furlong (2.2 miles) race. Neither horse giving an inch to the other, or expecting an inch from the other. The crowd was absolutely riveted to the proceedings. They were never more than a head apart as they bobbed back and forth the entire way around. When they flashed by finish post, this was before the advent of modern photographic equipment, it was declared that Preakness and Springbok crossed the finish line together and the race officially declared as a dead heat. The time was a new world record 3:56 ¼.
Preakness had run his last race in the U.S. Sanford shipped him and a few more horses to run in England and try for some prestigious races across the ocean. He took the Brighton Cup, a sixteen furlong race, with a second and third place finishes from four starts. Sanford then sold all the horses he brought over to England, including Preakness. The Duke of Hamilton bought Preakness for the purpose of standing him at stud. The Duke was big patron of the turf and like his new acquisition Preakness, had a somewhat high strung temper. The mixture of both horse and new owner would make for a tragic turn of events. The Duke of Hamilton shot and killed Preakness following a set to between them when Preakness refused to obey the Duke which angered the man to the point where he grabbed his rifle and fired. The fallout from the incident created an uproar of immense magnitude in the public. The Duke was publically vilified and the outrage led to a reform of the existing laws regarding animal cruelty. Although Preakness was no longer with us, his sad and unjust demise did lead to a better life for equines. The British government instituted severe penalties for unjust treatment of not only horses, but all other animals as well. Despite the cruel end of Preakness, his name will live on for all time through the Preakness Stakes. As the second jewel of the American Triple Crown, the Preakness Stakes is one of the big events of the racing year. There have been many great names that have won the fabulous Woodlawn Vase, the trophy given to the owner of the race winner each year. Twelve of the names are also on the Kentucky Derby and Belmont Stakes winners list, thus being the great dynamic dozen Triple Crown winners. The Woodlawn Vase is the most valuable trophy, from a point of monetary value, in American racing. The trophy is adorned with a likeness of Lexington, the sire of Preakness, perched on the top. The trophy is thirty pounds of solid sterling silver and was constructed in 1861. The trophy became the main award symbol for the Preakness Stakes winner in 1917 when Kalitan won the race. Due to its incredible value, the trophy is only brought out for presentation to the race winner, with a bevy of armed guards around, and kept under tight security for the rest of the year. This was not always the case. The owner was allowed to keep the trophy until the next year’s running. In 1953 when Native Dancer won the Preakness Stakes, Alfred Vanderbilt’s wife, the Vanderbilts bred and owned Native Dancer, proclaimed that the trophy was too valuable in both monetary and historical value to be removed from the grounds. 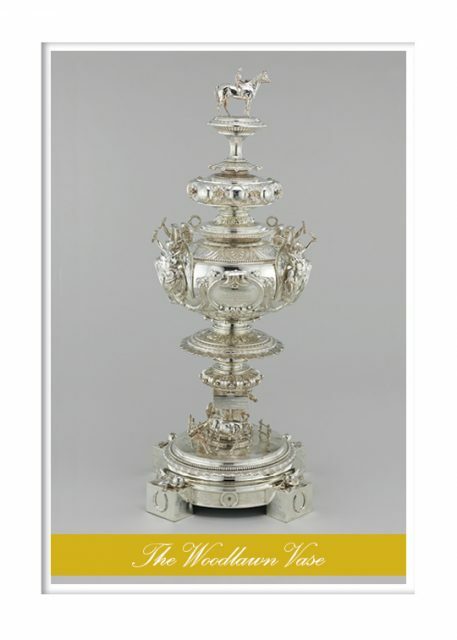 Since then, the winning owner, trainer and jockey are given scale replicas of the Woodlawn Vase as keep sakes, while the main trophy is kept on display at the Baltimore Museum of Art. The legacy of Preakness, although tragic when his life ended, is full of mystery and wonder. He lived more than one hundred and forty years ago. He was a fast bay coloured horse that could carry his speed to two miles and longer. He was sixteen hands at full growth, with powerful shoulders and sturdy well conformed legs. He might have made a big impact at stud, had he not died so young. His sire line was the strongest in America at the time, and even though he was in England, his blood would have mixed well with the existing blood there. Other sons of Lexington had success in the role later on. There have been many prestigious races run in honour of famous or beloved horses. None of these races however are legitimate classic races like the Preakness Stakes. Some like the Eclipse Stakes in England, Awesome Again Stakes in the U.S. and Northern Dancer Turf Stakes in Canada are legitimate G1 races, with many more in other parts of the world. The Preakness is the only classic. So when you watch the Preakness Stakes, revel in the atmosphere of tradition and excitement, and sing Maryland My Maryland as the field comes on the track, and give a thought to the horse the race is named in honour of. Preakness will live on as long as we have a Triple Crown to compete for. Yet another excellent, informative article. Thank you.